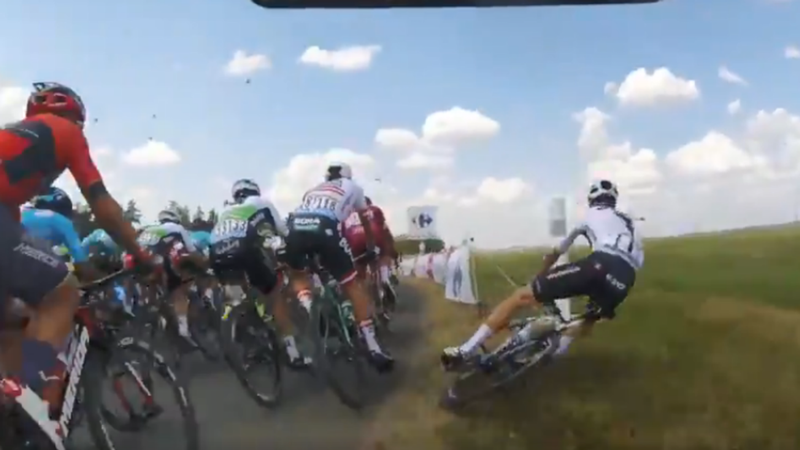 Week 1 was a mix of sprint finishes and crashes, stage 1 saw defending champion Chris Froome elbowed out, narrowly missing a pole, and somersaulting into a field. Peter Sagan won 2 stages and quickly took the Green points jersey. Greg Van Avermaet took in Yellow halfway through the week and took it through into week 2. One of the great cycling races is the Paris-Roubaix and for not the first time the Tour visited the course in week 2. John Degenkolb was King of the Cobbles winning the stage beating the yellow jersey Greg Van Avermaet. Sprinters Marcel Kittel and Mark Cavendish failed to meet the cut-off time in stage 11’s mountain stage and were disqualified from the Tour. 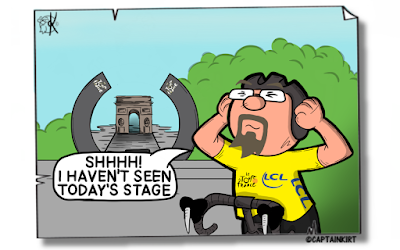 Stage 11 also saw welshman and Chris Froome's teammate, Geraint Thomas win the stage and take the Yellow Jersey. He also smashed it on Alpe d’hues winning the stage on one of the Tour's most iconic climbs. Peter Sagan took a 3rd stage win on stage 13's flat course. 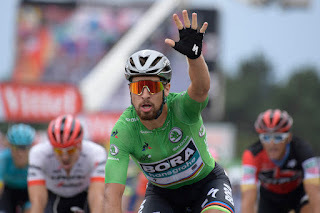 Sagan faced little opposition since the Alps dashed the hopes of the aforementioned plus Andre Greipel, and Dylan Groenewegen who also were dropped from the Tour. 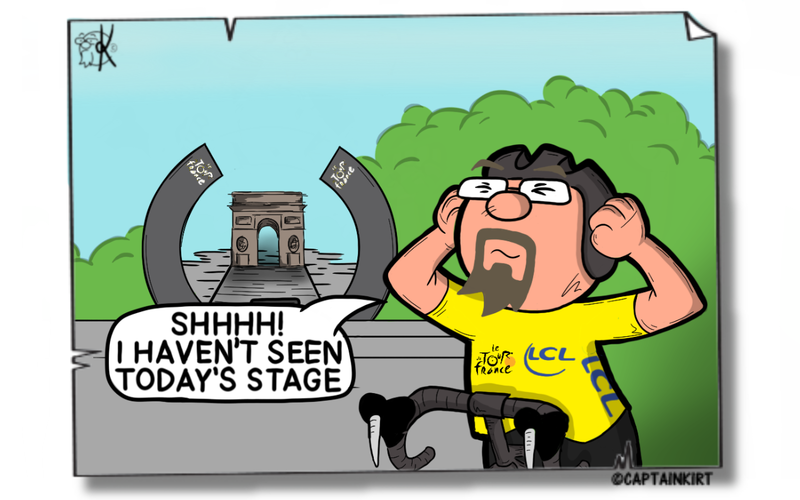 The final week saw G (Geraint Thomas) move to a defensive position with Team Sky working to defend the Yellow Jersey. At this point it was still unclear who was the leader of the team with both Froome and Thomas not saying who was in charge. Early into stage 14 there were some protestors (to what I don't know) that threw bales of hay across the road in an attempt to disrupt the race. Gendarmes used pepper spary in an attempt to control the protesters however the spray appeared to drift into the face of several cyclists as they rode past, forcing the stage to be paused briefly. 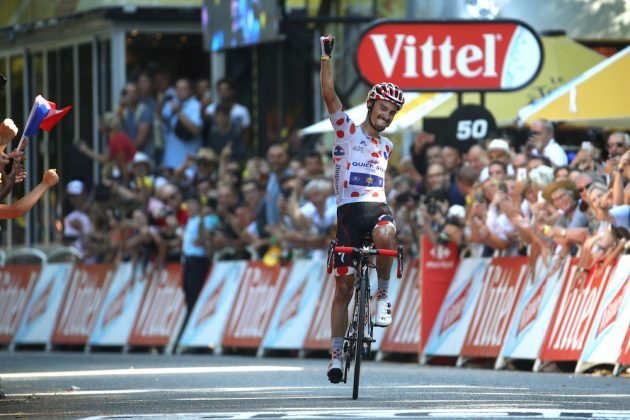 Julian Alaphilippe sealed the deal on the polka dot jersey and the King of the Mountain competition on stage 19 he's worn since his win during stage 10. Stage 17 saw something different with a short stage featuring a Formula 1 style grid start. I thought the start was gimmicky and didn't work. Froome cracked up on the mountain which saw G as strong as ever, even taking 2nd place. The week saw Froome support G in a galant way, almost a passing of the mantle. Stage 19 saw Chris Froome slip from the podium but his performance in the time trial on stage 20 saw him regain that position. G took 3rd and cemented his victory (barring the ceremonial stage tomorrow into Paris). The final stage was the usual procession with photo calls and champagne along the way. 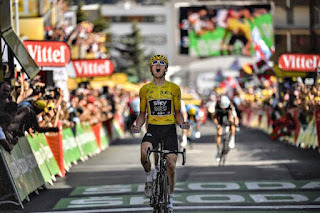 Geraint Thomas' victory was assured and the only thing that awaited was the sprint race along the Champs Ellysse. The presentations after the completion made everything official and G's speech was honest, unprepared and finished off with a mic drop.